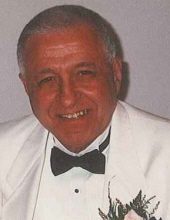 Louis J. Simonetti, 89, of Conshohocken, formerly of Jeffersonville, PA passed away on April 7, 2019. Devoted husband of the late Catherine “Penny” (Paneghello) and son of the late Saturno and Drusianna (D’Annuzio) Simonetti. Preceded in death by siblings Jean, Philomena, and Sam. Beloved father of Mary (Thomas Cowgill), Louis, Jr. (Alexis), Diane (James Del Buono), Joseph (Lisa), and Steven (Terri), and eight grandchildren, Evan, Anthony, Gregory, Austin, Gemma, Victoria, Alexandra, and Nicholas, and many nieces and nephews. Relatives and friends are invited to his Viewing on Friday, April 12, 2019 from 9:00-10:20AM at St. Matthew’s Church, 219 Fayette St. Conshohocken, PA, followed by his Funeral Mass at 10:30AM. Entombment in St. Patrick’s Mausoleum. Family requests Mass intentions for Louis through the Seraphic Mass Association at www.SeraphicMass.org. To send flowers or a remembrance gift to the family of Louis J. Simonetti, please visit our Tribute Store. "Email Address" would like to share the life celebration of Louis J. Simonetti. Click on the "link" to go to share a favorite memory or leave a condolence message for the family.